Basic biology textbooks may need a bit of revising now that biologists at UC San Diego have discovered a never-before-noticed component of our basic genetic material. According to the textbooks, chromatin, the natural state of DNA in the cell, is made up of nucleosomes. And nucleosomes are the basic repeating unit of chromatin. 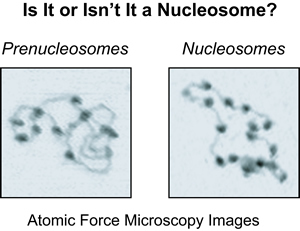 When viewed by a high powered microscope, nucleosomes look like beads on a string (photo at right). But in the August 19th issue of the journal Molecular Cell, UC San Diego biologists report their discovery of a novel chromatin particle halfway between DNA and a nucleosome (photo at left). While it looks like a nucleosome, they say, it is in fact a distinct particle of its own. The biologists say that while the pre-nucleosome may look something like a nucleosome under the microscope, biochemical tests have shown that it is in reality halfway between DNA and a nucleosome. 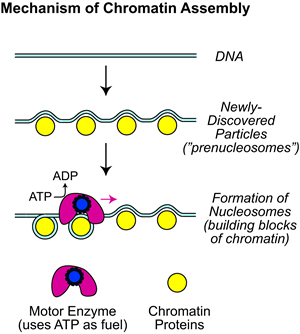 These pre-nucleosomes, the researchers say, are converted into nucleosomes by a motor protein that uses the energy molecule ATP (see graphic).